Cesarean scar ectopic is the one of the rarest locations for an ectopic pregnancy. The incidence is increasing because of the rise in rates of cesarean section. It requires prompt diagnosis and management, in order to prevent complications like uterine rupture, massive hemorrhage and hypovolemic shock. We report a rare case of intramural pregnancy with implantation in a previous cesarean scar. A 27 year old G6P2L2MTP3 with two months amenorrhea, presented to our emergency department, with chief complains of acute lower abdominal pain. She gave history of bleeding per vaginum for 3-4 days followed by spotting per vaginum for 3 days. Urine pregnancy test was positive. She underwent two lower segment cesarean sections prior, the first of which was 6 years ago for postdatism and the latter was 17 months prior in view of refusal for vaginal birth after cesarean section (VBAC). She had past history of three medical terminations of pregnancies followed by dilatation and curettage, each in view of incomplete abortion. Ultrasonography suggested early viable pregnancy with a single gestational sac of 7 weeks 4 days in the anterior wall of lower uterine segment (lower segment cesarean scar area) with decidual reaction. The uterine cavity was empty with clearly defined endometrium. Cervical canal was empty and bilateral adnexae were normal. These findings were confirmed by MRI pelvis. On MRI pelvis 18x8 mm gestational sac implanted within the anterior myometrium of the lower uterine segment in the region of previous cesarean scar was seen, with vascularity within. The anterior myometrium anterior to gestational sac was thinned out to 1-2 mm (figure 1). Figure 1. 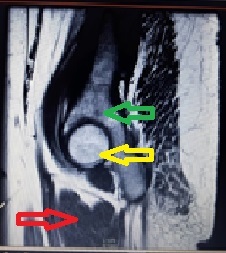 MRI image showing scar ectopic with yellow arrow pointing to gestational sac; green arrow pointing to empty uterine cavity and red arrow pointing to bladder. The patient was posted for laparotomy and intraoperatively, a soft and vascular mass was seen at the site of previous cesarean scar. Incision was taken on the bulge and products of conception were evacuated gently. Uterine scar was extremely thinned out (figure 2). Figure 2. Intraoperative picture showing thinned out uterine scar. Figure 3. 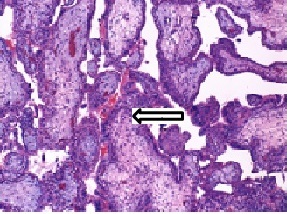 Arrow pointing to chorionic villi at the site of cesarean scar. Products of conception were communicating with the uterine cavity; edges of scar tissue were excised and freshened. Products of conception and the cesarean scar both were sent for histopathological examination. The products of conception sent for examination showed endometrium with hyper secretory glands and Arias Stella reaction (figure 3). Extensively decidualised stroma and many chorionic villi with trophoblastic tissue were also seen. The cesarean scar sent for histopathological examination showed dilated and hypersecretory endometrial glands surrounded by decidualised stroma. Few basal glands were also seen penetrating the myometrium. (Figure 4) Patient had an uneventful postoperative course and was chose barrier method of contraception. Figure 4. Uterine scar tissue showing endometrium in secretory phase. 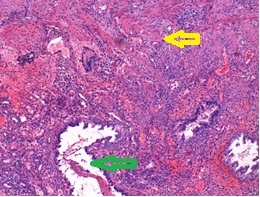 Yellow arrow pointing to stroma and green arrow pointing to endometrial glands. Ectopic pregnancy in a previous cesarean scar was first reported by Larson and Solomon in 1978. The prevalence is about 1 in 1800 to 1 in 2216 ectopic pregnancies. The documented risk factors include previous dilatation and curettage, previous placental pathology, manual removal of placenta, previous ectopic pregnancy, in vitro fertilisation, two or more previous cesarean sections, and other uterine surgeries like myomectomy, metroplasty or operative hysteroscopy. Our patient had history of three curettages and two prior cesarean sections, increasing her chances of this type of ectopic pregnancy. It is believed that the myometrial implantation occurs through a microscopic route or a dehiscent area in the previous uterine scar, immaterial of the reason of the scar. When the blastocyst implantation takes place in the fibrotic scar, further growth occurs unpredictably. In one type, there can be an anterior progression, leading to scar ectopic pregnancy, or if worse, can cause bladder invasion and related problems. In the other type, it can progress towards the endometrial cavity, resulting in a successful pregnancy, but causing adherent placenta. MRI findings are identical to those seen on ultrasound. The implantation of gestational sac on previous cesarean scar, central myometrial defect and empty endometrial-endocervical canal. MRI imaging can be used to evaluate placental localization and degree of invasion. Our patient showed typical changes in the MRI. The goals of treatment are termination of pregnancy, reduction of hemorrhage, prevention of uterine rupture and preservation of fertility. Observation is generally not recommended. Medical line of management is using methotrexate, which can be given intramuscularly, intravenously, or locally under image guidance. It has shown to be effective at a dose of 50 mg/ m2 when β-hCG is less than 5000 mIU/ml. Uterine artery embolization is used in conjunction with medical treatment. According to recent studies it is safe, effective and causes less morbidity. Operative hysteroscopy has much lesser complication rates of 18%. It allows direct visualization of vessels at the site of implantation of gestational sac, short operative period, less blood loss and higher success rate than laparotomy or laparoscopy. When cesarean scar ectopic is deeply implanted, laparoscopy is needed to exclude bladder involvement. Laparotomy is an accepted method required when there is high suspicion of uterine rupture and can be beneficial in preventing further cesarean scar implants by excising the old scar. Cesarean scar ectopic now figures in the differential diagnosis of early pregnancy complications. The clinician should be aware of this condition. While other forms of treatment are available, laparotomy is safe and this case demonstrates the same. We thank Dr Asha Shenoy, Professor and Dr.Pragati Sathe, Associate professor, Department of Pathology, Seth GS Medical College and KEM Hospital for the histopathology slides. Vial Y, Petignat P, Hohlfeld P. Pregnancy in a Cesarean scar. Ultrasound Obstet Gynecol 2000; 16(6): 592-3. Fylstra DL, Pound-Chang T, Miller MG, Cooper A, Miller KM. Ectopic pregnancy within a cesarean delivery scar: a case report. Am J Obstet Gynecol. 2002; 187(2):302- 4. Larsen JV, Solomon MH. Pregnancy in a uterine scar sacculus: an unusual cause of postabortal haemorrhage. A case report. S Afr Med J. 1978;53: 142-3. Seow KM, Huang LW, Un YH, Un MY, Tsai YL, Hwang JL. A cesarean scar pregnancy: issues in management. Ultrasound Obstet Gynecol 2004; 23(3):247-53. Graesslin O, Dedecker F Jr, Quereux C, Gabriel R. Conservative treatment of ectopic pregnancy in a Cesarean scar. Obstet Gynecol 2005;105: 869-71. 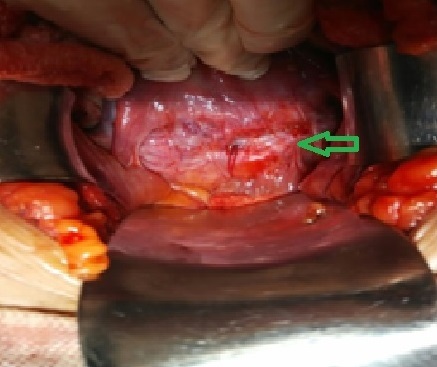 Marchiole P, Gorlero F, de Caro G, Podesta M, Valenzano M. Intramural pregnancy embedded in a previous Cesarean section scar treated conservatively. Ultrasound Obstet Gynecol 2004; 23:307-9. Yang M, Jeng MH. Combination of transarterial embolization of uterine arteries and conservative surgical treatment for pregnancy in a cesarean section scar. J Reprod Med 2003;48(3): 213-6. Lee CL, Wang CJ, Chao A, Yen CF, Soong YK. Laparoscopic management of an ectopic pregnancy in a previous cesarean section scar. Human Reprod 1999; 14:1234-6. Lai YM, Lee D, Lee CL, Chen TC, Soong YK. An ectopic pregnancy embedded in the myometrium of a previous cesarean section scar. Acta Obstet Gynecol Scand 1995;74(7):573-6. Mhaske NC, Jhaveri R, Prasad M, Kharat D, Fonseca MN. Conventional laparotomy for management of Caesarean scar ectopic pregnancy: a case report. Int J Reprod Contracept Obstet Gynecol 2015; 4:1581-4.